Note: This article on telehealth is the second of a series that address issues raised by physical therapists on various social media network groups where we are also members. It’s never a really “bad” problem, of course, to have too many patients. The issue becomes when you can’t treat them in person often enough. Patients might fall behind with their rehabilitation plan or be in discomfort until you see them again. And that doesn’t do much for the patient’s well-being or experience with your practice. We are familiar with the challenge of staying connected with patients between sessions. Unfortunately, we are unable to add hours into the day. We also cannot supply you with enough energy bars to see all the patients who want to see you on a given day. 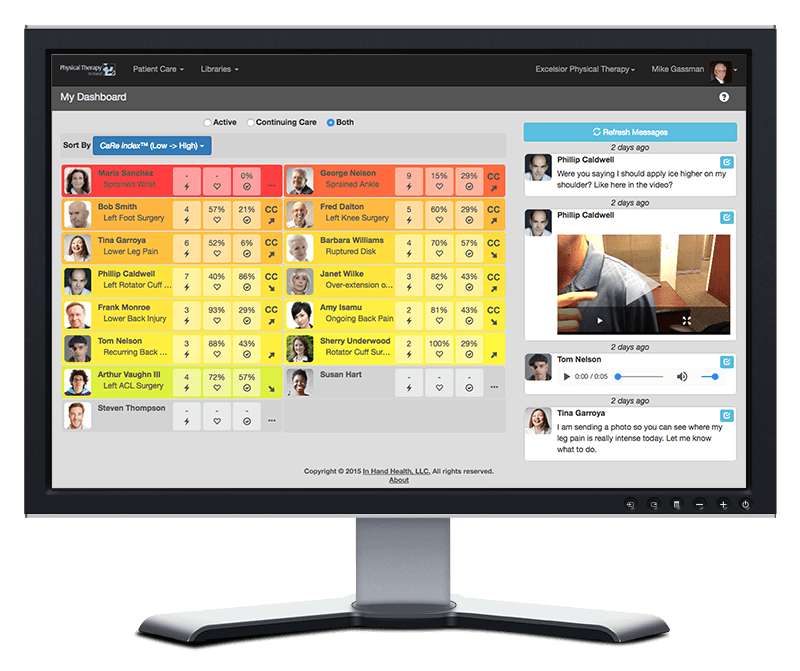 However, with input from many PTs, we built a few features into our telehealth solution to address this problem. See if any of these can help you bridge the communication gap with patients between visits. In our telehealth solution, PTs manage patients in a web application called Physical Therapy In Hand. After signing in, a physical therapist lands on the Patient Dashboard. In one glance, PTs see which patients are keeping up with their home exercise program. 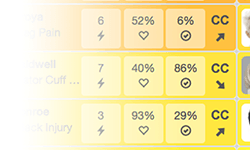 They also see who is reporting positive feedback and experiencing low pain in the yellow and green backgrounds. Patients in red and oranges, meanwhile, are on the other end of the spectrum. They might need an encouraging message (see below) or more investigation into possible problems. Also note the trend arrows. They are based on a moving average score of a patient’s adherence to an exercise program and reported feedback. The arrow responds by tipping up (likely progressing well) or down (perhaps needing some contact before the next visit). HIPAA-compliant messaging from therapist to patient or patient to therapist is one of the fundamental features of our telehealth solution. 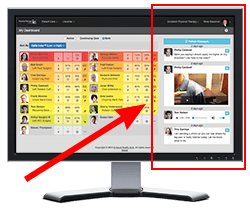 On the right side of the Patient Dashboard, a PT will see all incoming new messages from patients since his or her previous sign in. The therapist just needs to click or tap a message to enter that patient’s record and type a response. The patient, meanwhile, is receiving and sending these messages from their smartphone inside the In Hand Health Patient App, which he or she also uses to receive video exercises and record feedback in between sessions. Bonus: Messages sent on our telehealth platform can be texts, images, videos, or audio clips. Physical therapists can also access the patient dashboard and secure messaging features from a smartphone instead of a desktop or laptop in an “app version” of Physical Therapy In Hand we provide called Therapist Essentials. 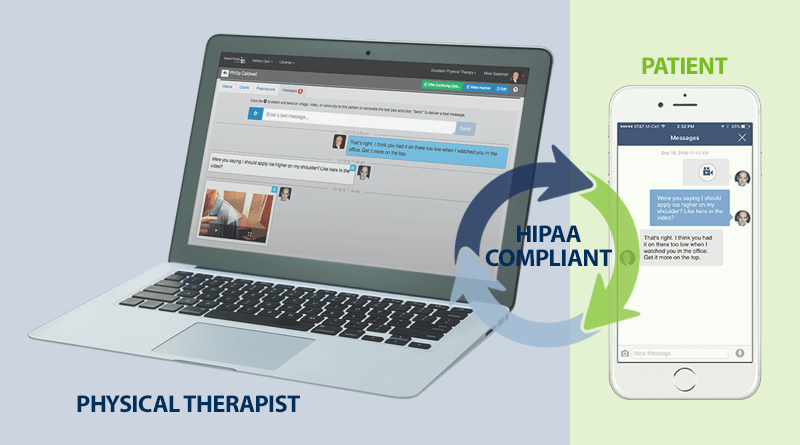 Once signed into the app, therapists get a view of their patient dashboard and are able to trade HIPAA-compliant telehealth messages with their patients. 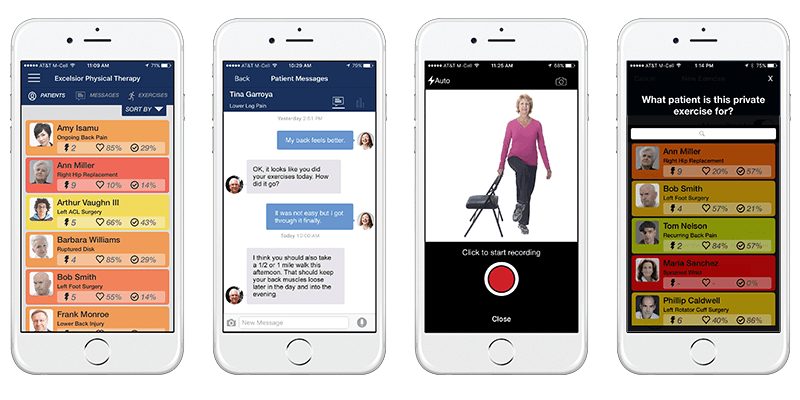 In addition, Therapist Essentials enables a PT to record and distribute a private (secure) exercise video for any patient instantly in the app should the need arise between sessions. So while you can’t see every patient every day, these three telehealth-based methods should help you keep tabs on your patients in between sessions. And imagine the security your patients will have knowing they can reach you between sessions with any questions directly from their smartphone. You can offer this telehealth service today. Simply request an invitation to our solution at our website. After you get started, enter a patient into our system. 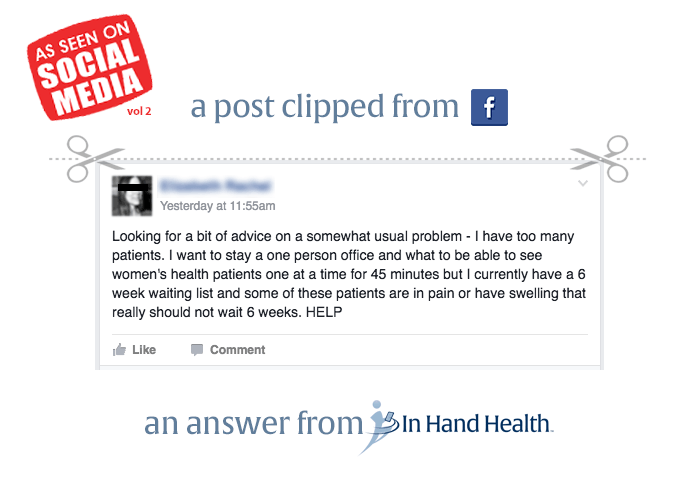 He or she will receive an email inviting them to download the In Hand Health Patient App. From there, your connection is established. You can start off by simply sending secure messages back and forth with your patient. After you master that, send video-based home exercise programs from our library or use your own videos, monitor adherence to exercise plans, and, yes, stay connected through telehealth messages until your next appointment – no matter how many patients you have. Next Next post: Physical Therapy Telehealth Solutions Will Move PT Forward. If You Try Them, That Is.